The general rule is that courts have inherent jurisdiction in the absence of the laws to regulate matters otherwise. If there is a law which articulates over the certain issue that legal intuition cannot hold water. With due respect the Chief Justice pursuant to the laws of Swaziland had no powers to do as above mentioned since the Criminal Procedure and Evidence Act No. 67/1938 under section 31(1) provides that all matters relating to issuance of arrest warrant of any person or further detention of a person arrested without a warrant in that legal regard vests within the magistrate not otherwise. Basing on the above law and section 2(2) of the High Court Act No. 20 of 1954 which provides that the High Court shall exercise its powers in the manner provided by Criminal Procedure and Evidence Act’; Judge, Mamcy Dlamin vehemently on Sunday 6 April 2014 in the presence of about 500 audience [among whom were the American ambassador and African Commission envoy] stated that it was her considered views that had the applicants informed the honourable Chief Justice as they explained to her by virtue of section 31 of the above Act he would have not have issued the arrested warrant since the magistrate is the only with powers. It is important to note that freedom of expression, freedom of media, the right to bail, right to liberty and right to work were affected to the great extent. The judiciary is endowed with all powers to adjudicate over disputes of any nature involving the violation of fundamental human rights as enshrined in the Constitution. Therefore, the courts have to safeguard the rule of law, Bill of human rights, democracy and the common good of the people. It is always improper the courts to be a source of conflicts. The judiciary is the temple of justice and the persons who sit in it have to be impartial, not influenced in any way and should be persons of impeccable and unquestionable loyalty but the fact is that the incumbent Chief Justice of Swaziland is facing allegations in Lesotho and he lost an appeal for charges against him. Furthermore, the courts have failed to interpret the 2005 Constitution of Swaziland. Section 157 of this Constitution provides that there shall be no further appointment of Justices who are not citizens of Swaziland and one shall be not be appointed as Justice after seven years from the commencement of this Constitution and a judge [e.g. Ramodibedi]on contract shall vacate office at the end of the period provided in the contract. Unexpectedly, on 10 April 2014 the released applicant was re-arrested as a result of an appeal by the executive to the Supreme Court and this notorious act made the Swazi Law Society as well as the Swazi Journalists meet to think of resolutions that could be carried out and implemented on April 14, 2014. 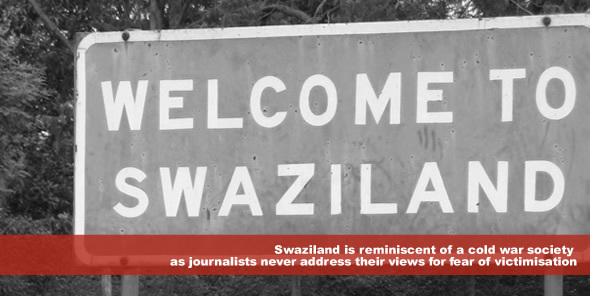 Generally, Swaziland is reminiscent of a cold war society as journalists never address their views for fear of victimisation and suspension from their jobs since such organs are owned by political elites. On 11 April 2014 the heads of the Trade Union of Swaziland were arrested. Both the lawyers and journalists consider the judiciary as enemy of freedom of media and human rights. The issue is unknown. Njiti Lucius Batty holds a Bachelor of Laws (LLB Hons) from Ruaha University College a Constituent College of St. Augustine University of Tanzania, and is expected to graduate in November 2013 with a PGD in Legal Practice at the Law School of Tanzania, Tanzania. He is a Candidate Advocate in the High Court of Tanzania and also a Tutorial Assistant and Coordinator of the University of Dodoma Law Society & Moot Court at the University of Dodoma, Tanzania. His research interests include international human rights and international humanitarian law.